Garrett Ward Sheldon is a professor of political science at the University of Virginia’s College at Wise. This book is an extremely detailed description of James Madison’s composition of his notes on the Constitutional Convention in Philadelphia, written largely during the period during and shortly after the Convention (1787-1789) and his minor, but extensive, revisions of the text over the next fifty years. The author goes into excruciating detail about the technical aspects of the writing of this record of the U.S. Constitutional Convention, including the size and shape of the paper used; whether it was lined; its folds and margins; watermarks revealing the manufacturer of the paper (newly revealed by the “latest in digital research technologies”) and Madison’s style of revisions: whether made on added slips of paper; written in the margins; or above crossed-out previous writing. Because the real lesson, ostensibly discovered by this book, is that all of Madison’s revisions of his constitutional record (which are largely minor, spelling, context and diplomatic) over the fifty years during and after the Convention reveal that it is all about “revision” – changing the foundational document of our republic, and its ideas of rights, democracy, federalism and, well, everything. Because Madison (and the other delegates) went into the Philadelphia Convention merely to revise the Articles of Confederation, the 1787 proceedings were not to produce “The” Constitution (permanent, stable based on perennial principals and philosophies), but merely one of perhaps many temporary, transient, expedient forms of governance, we need not take the final Constitution seriously (notwithstanding the anticipated revisions during the ratification debates, the adoption of the Bill of Rights, and the Amendment procedures). 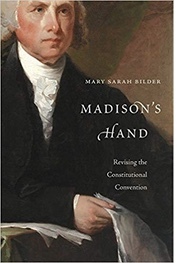 In the author’s view, her painstaking study of the innumerable, albeit largely technical and minor, revisions to Madison’s Convention notes affirms the tentative nature of Madison’s authorship, influence and commitment to the U.S. Constitution. This thesis comports will with the Revisionist “Living Constitution” view of American jurisprudence: where the text and meaning of our foundational document are “evolving” over time, properly altered with social progress and changing views of justice and rights; not fixed principles or permanent structures based on perennial philosophies: views of human nature and society that are consistent and permanent. So, this author’s perspective is that the underlying philosophies of the U.S. Constitution in Locke’s Natural Rights ideology; Montesquieu’s separation of powers; Aristotle and Cicero’s views of man’s social nature and resultant democracy; the Reformed Christian suspicion of human nature and evil (all prevalent in the Founding period and known by the classically educated Founders), do not provide a stable, solid, permanent foundation for the Constitution and Republic, but we are all subordinate to the vagaries of contemporary political controversies, personalities and interests; relativistic and transitory. And so in this view such mutability of social and government should continue right up to our own time: the Bill of Rights protections of Freedom of Speech, press, religion and Due Process of Law may be modified by future generations, especially if some speech or religion may offend certain groups, or the rights of the accused and judicial procedure are perceived as unfair or irrelevant to certain classes of accusers or aggrieved. These are the implications of the author’s revision of the meaning of Madison’s revisions. Unfortunately, this perspective seemingly relies on an almost total absence of knowledge of American history, historiography and American political thought. The author admits as such in the book’s introduction and provides copious notes referring to such scholarship to “enrich this book’s argument” but such insouciance is not a substitute for integrating this knowledge into the book’s implicit message. This may also explain why the author describes the purposes of this book in humble terms as (1) How did Madison write the Notes? and (2) How did he revise the Notes? leaving (3) How do these alter our understanding of the Constitution? to others. But, this is a bit disingenuous, given her repeated forays into the last question. Professor Bilder teaches at Boston College Law School, where she specializes in Property, Trust and Estate Law (and apparently, since the publication of this book, is considered an expert on constitutional history and law). However, this book’s presentation of early American politics and ideology remains at a very elemental level. For example, the author’s understanding of Founding political conflicts remains at a civics level of simplicity: Hamilton was for centralized government; Jefferson was for decentralized government; Madison began as a Hamiltonian Federalist but moved to become a Jefferson Republican. Such an embarrassing over-simplification of Founding principles and politics may explain the author’s odd conclusions from Madison’s Notes revisions. For example, it was Madison’s subtle understanding of federalism’s balancing of national and states’ authority that caused him to shift (largely to protect fundamental democratic principles) from Hamiltonian to Jeffersonian prospectives. When during the Revolutionary War the almost total absence of centralized sovereignty almost resulted in our defeat, (as well as localized violations of human “rights”) Madison argued for strong central power. When that very central power was used by President John Adams’s Federalists to threaten basic rights to free speech and press (through the Sedition Act), Madison appealed to States Rights (via the Virginia Resolutions) to protect fundamental constitutional rights. These ideological shifts seem a closed book to Professor Bilder, who ascribes such changes to Madison coming under the influence of first Hamilton and then Jefferson. His revisions to his Constitutional Convention notes apparently, then, represent such personal affinities and their attendant policy preferences. This trivializes both Madison’s independent and quite brilliant intellect, and the ideological depth of the Early American period. This unfamiliarity with eighteenth century concepts seems to extend to certain words, such as the common reference to weak or ineffectual governments as “impotent.” The author makes the curious aside that “The implicit sexual connotations to a Convention of men may have been an irresistible ending.” Apparently, although the Founders were not conversant with John Locke, Aristotle or Montesquieu, they were thoroughly familiar with Foucault. Despite these serious problems, this book does have some valuable bits. Besides the exhaustive details of the minutiae of Madison’s revisionary Notes on the Constitutional Convention, Madison’s Hand brings out some interesting points. The mention of British cultural conceptions of “Constitution” and how it informs the written form is important and could be expanded. Also, Madison’s substantive reasons in arguing for the “Three-Fifths Compromise,” other than political expediency is significant. If either of these theoretical nuances had been developed, it would have strengthened the book. A few other weaknesses of the work are its rather technical (not to say dry) writing style; frequent repetition (e.g. that Madison revised the Notes for Jefferson); and a somewhat disjointed organizational structure, reflecting the fact that it came out of several law school conferences (as mentioned in the acknowledgements) rather than a unified whole desirable in a long book. In spite of these embarrassing omissions and scholarly deficiencies, this volume is a valuable contribution as a purely documentary record of Madison’s construction of his Notes of the Constitutional Convention, and its revisions in all their minute detail. If the author had confined herself to this limited and highly specialized task and not presumed to infer political, legal and philosophical lessons from it, this would have been a better effort. This book won the Bancroft Prize.